Rouen, au fil des jours...: Au Palais de Justice, les gargouilles mÃ¨nent la danse ! Beautiful archetecture! Although I've never been a big fan of gargoyles. How cool is this?! Very neat. I love decorative architecture. I'm really fond of gargoyles. This one is on the Law Court (formerly the Parliament of Normandy) and dates back to the late Middle Ages, the construction began in 1499. 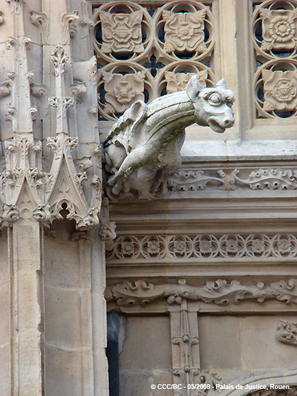 The central building, on which this gargoyle "lives", is typically gothic. The whole building is being restored, it is not finished yet. That's why the gargoyle seems so neat.